On 24 December 1876 he married to Rebecca Emaline Loftis in Van Buren County, Arkansas. [Arkansas, Confederate Pension Records, 1891-1935, accessed through Ancestry.com.] David and Rebecca had six children together, all listed below. David worked as a blacksmith for most of his life. 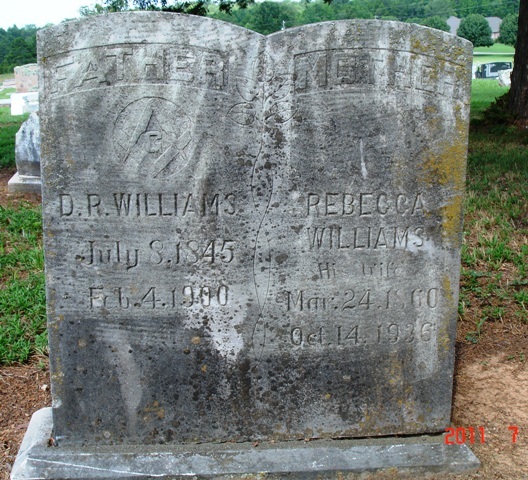 He died on 4 February 1900 and on 14 October 1936 Rebecca followed in death. 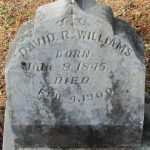 Both died in Quitman, Cleburne County, Arkansas, and are buried there beside each other in Quitman Methodist Cemetery. Sarah Nichols Williams (known as “Zorah”) was born in August 1881 in Quitman, Cleburne County, Arkansas. She married Steven Elliott Donnell (“Elliott”) on 4 October 1903. [Steven Donnell was born on 12 March 1878 to Frederick Herbert Donnell and Mrs. Harriett (Dickens) Rogers.] Elliott worked as the City Marshall of Quitman. The Van Buren County Democrat, citing the Arkansas Gazette, relates a story of him shooting and killing a drunken man, allegedly in self-defense. [Van Buren County Democrat, 31 December 1909, p. 1.] In relaying the information the newspaper notes, “Donnell bears a good reputation, he has served as a marshal only about two weeks, having been sworn in recently to assist in preserving order here during the holidays.” Together Zorah and Elliott had three children, listed below. Zorah died in 1928 and is buried in Quitman Methodist Church Cemetery. Elsie Mabel Donnell was born in 1905. Nina M. Donnell was born in 1907. Margarite M. Donnell was born in 1911. Pearl E. Williams was born on 1 Nov 1885 in Van Buren County, Arkansas. On 22 October 1910 she married James Aden Chism in Cleburne County, Arkansas, and together they had one child. [James Chism was born on 28 July 1880 in Calhoun County, Mississippi, to Jesse Ledbetter Chism and Sarah Harrison Sturdivant.] James worked as a blacksmith and also as a deputy city marshall of Quitman, presumably with his brother-in-law Elliott Donnell. Pearl died on 10 April 1916 in Quitman, Arkansas, and James died many years later on 3 January 1953 in Jefferson County, Arkansas. Esker Donald Chism was born on 25 August 1911 in Cooper, Delta County, Texas and married Alpha Magdalene Stephens on 15 February 1936 in Faulkner County, Arkansas. [Alpha was born on 27 September 1917 in Mayflower, Faulkner County, Arkansas, to Thomas Jefferson Stephens and Susie Ann Linhart.] Together they had one son and four daughters. Esker served in the Army during World War II in the Civilian Conservation Corps. Afterward he played minor league baseball, worked as a high school machine shop teacher in Little Rock, Arkansas, and as a cotton farmer in Arkansas. He also worked at Caterpillar Inc. for twenty-five years, retiring in 1976. Esker was a member of United Auto Workers Local 974. Esker died on 28 January 1998 and Alpha followed on 16 January 2004, both in Tazewell County, Illinois. Stella Rosetta Williams was born on 31 May 1888 in Van Buren County, Arkansas. She married Riley Alexander Evans on 20 March 1910 in Cleburne County, Arkansas. [Riley Evans was born in about 1881 in Arkansas.] Together they had two children. Stella died on 8 May 1988 in Quitman, Cleburne County, Arkansas, and is buried there in Quitman Methodist Church Cemetery. Fay Evans was born in 1911. Georgia Augusta Williams (“Gus” or “Gussie”) was born on 19 April 1891 in Quitman, Cleburne County, Arkansas. He married Clarence New on 12 October 1915. Clarence was a sister to the husband of Gussie’s sister Ida. [Clarence New was born in November of 1891 in Benton, Saline Co., Arkansas to George Andrew New and Mary Frances Magdalene Jackson.] Clarence died on 11 July 1966 and Gus followed on 18 January 1980, both in Faulkner County, Arkansas. Ida L. Williams was born in March 1894 in Quitman, Cleburne County, Arkansas. She married Willie New on 27 March 1915. [Willie New was the son of George Andrew New and Mary Frances Magdalene Jackson.] Together they had one son, Durward A. New, born in about 1817 in Arkansas. Clarence Milton Williams was born on 29 May 1897 in Quitman, Cleburne County, Arkansas. He married Jennie Lara Crow on 10 April 1920 and together they had three children. [Jennie Crow was the daughter of George W. Crow and Selma Matilda Johnson.] Clarence died on 15 August 1973 and Jennie followed in March 1976, both in Quitman. They are buried together there in Quitman Methodist Church Cemetery. 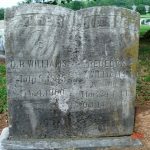 Georgia Lerlene Williams was born on 8 May 1821 in Quitman, Cleburne County, Arkansas. She married Louis Lafayette Osborne on 4 July 1941 in Cleburne County, Arkansas. [Louis was born on 23 November 1919 in White County, Arkansas, to Roy Vernon Osborne and Bessie V.] They had two children, Laura Sue Osborne and James “Jim” Osborne. Georgia died on 1 January 1977. 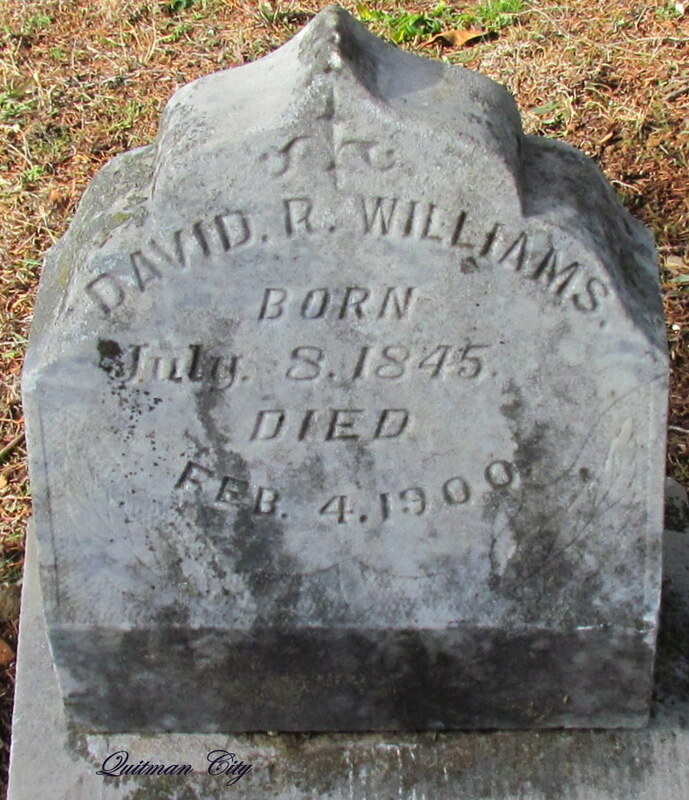 David Williams died as an infant. Edwin Layne Williams was born on 18 April 1931. He married Patsy Ruth Wortham on 17 April 1954 in Joy, Arkansas. [Patsy Wortham was born on 30 June 1935.] They had three sons: Terry Williams (married to Darlene), Dennis Williams (married to Debra), and William Williams (“Bill”). They were members of the Faith Baptist Church in Quitman, Arkansas, and Edwin was a member of the V.F.W. Post #7514. Edwin died on 10 January 2006 in Quitman.